A North Sea diver cheated death after a catastrophic computer failure saw his boat drift away and his oxygen supply cut off. Chris Lemons lay almost 100m (about 300ft) under the surface, resigned to ending his days in the dark water. But the miracle of his colleagues' superhuman efforts to save him, and his body lasting 35 minutes on a six-minute emergency air tank, saw him not only living to resume his diving job and marry his fiancee, but to suffer no ill effects of a lack of oxygen. His extraordinary true story has been made into a documentary film, Last Breath. Edinburgh-born Chris, who lives near Mallaig in the Highlands, is a saturation diver. This is a specialised type of diving which reduces the risk of decompression sickness due to use of a mixture of oxygen and helium. Chris worked in the North Sea, diving from his ship the Bibby Topaz in a diving bell, repairing oil rig structures. But what started as a normal day in September 2012 ended in a drama no-one thought Chris would survive. Chris, with colleagues Dave Youasa and Duncan Allcock, were lowered 91m in their diving bell to fix a pipe on the sea bed at the Huntington Oil Field east of Peterhead in Aberdeenshire. The ship was enduring 35-knot winds but Chris says that was standard weather for that time of year. Chris was in the middle of the repair when he heard an alarm. 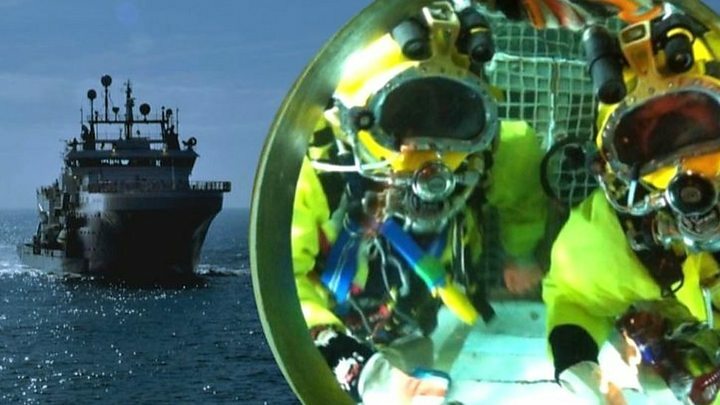 He told BBC Scotland news: "We had a constant line of communication with dive supervisor Craig - up in the ship - through an earpiece in our helmets. "The first and only indication was to hear the alarm sounding in dive control, which was not unusual because they test them. "But it was quickly followed by Craig asking us to get out of the structure, get on top of it and get back to the diving bell as quickly as we could and we could tell from the urgency in his voice that this wasn't a drill, this was something serious." What Chris and Duncan didn't know was that the ship was moving away. The computer which kept the ship in position had failed. What happened next was nothing short of a disaster. Chris's umbilical cable - a tether back to the diving bell and the ship, which provided the divers with breathing gas, hot water to keep the suits warm in the three-degree sea as well as light and electricity - became snagged on part of the metal structure. Straight away he knew he was in serious trouble. He said: "You had 8,000 tonnes of boat essentially pulling against you and I was basically an anchor to that in the bottom and there was only going to be one winner in that circumstance. "The umbilical provides us with everything. The only thing we carry in addition to that is a bail-out bottle which is a set of normal diving cylinders on your back with emergency gas in them, but because of the depth you're working at you use that extremely quickly so I estimated I had about five, maybe six minutes of gas to sustain me which it turned out wasn't long enough." His colleagues could not give him any slack - the umbilical was pulled so tight it was bending a stainless steel rack off the wall in the diving bell. Chris recalled: "First, the communications cable snapped. Then the gas hose stretched to the point I had nothing to breathe. I opened the supply on my back. This happened within about 30 seconds. "Soon after that the umbilical snapped like a shotgun going off and I fell down to the sea bed. Nearly 100m (approx 300ft) down in absolute darkness at two in the morning. I managed to find the structure we had been working on and found a way to climb up on top of that." But the diving bell wasn't there and Chris began to calculate he had already used up about two or three minutes of gas. The chances of rescue in that timeframe were almost non-existent. Chris said: "I realised very quickly that the end was nigh. I was on a countdown clock and it was counting very fast." The realisation saw a calmness descend upon Chris as he accepted his fate and blacked out. He remembered: "I think once I accepted there was no hope of survival, I was powerless to do anything to save myself. A quiet resignation came over me. "I remember it being a period of great sadness really, of disbelief. How I could find myself in this dark sad horrible place and this is where I would end my days. I thought of everybody at home and the chaos I would cause." His colleagues put in a superhuman effort to locate him, believing they were coming down to recover a body. Dave hauled him to the diving bell where his colleague Duncan gave him two breaths. Miraculously - he spluttered to life. It was 35 minutes after he had turned on his emergency supply of air. With nothing to breathe for that long, Chris could easily have suffered brain damage. But he was fine. Image caption Morag is grateful for Chris's rescue: "I came ridiculously close to losing him and being robbed of the life we were going to have"
He said: "I assumed it was the extreme cold of the water that slowed my functions down. But the gas we breathe has a high concentration of oxygen which saturated my tissues and cells to allow me to survive." Chris was back in the sea with his team three weeks later and married fiancee Morag Martin a few months later. And six years later, Morag is still grateful to Dave and Duncan. She said: "My stomach still churns to hear the story. I came ridiculously close to losing him and being robbed of the life we were going to have. "I'm extremely grateful to both of them." Last Breath is in cinemas from Friday.